Participation in the auction (public sale) in person, in writing or by telephone is realised on the basis of these terms and conditions of auction. 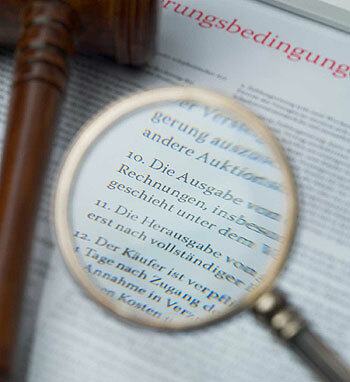 The terms and conditions of auction are published in the auction catalogue, on the Internet and in clearly visible postings on the premises of the Auktionshaus Kaupp GmbH. By placing a bid, the buyer accepts these terms and conditions of auction as binding. 1. The auction is carried out voluntarily on behalf and for account of the clients. The figures in parentheses identify the owner and/or client. 2. All objects submitted for auction may be inspected and checked in the framework of the auction viewing. They are all used without exception. In all cases, the actual state of the object to be auctioned off at the time of acceptance shall be the agreed quality in the sense of the statutory provisions. The descriptions and information contained in the catalogue, in the status report or in expert opinions are also estimates and constitute no warranty as defined by § 443 BGB [Civil Code] for the quality of the object of art. The same shall apply to the pictures in the catalogue. The purpose of these pictures is to give prospective buyers an idea of the object to be auctioned off; they are neither part of the agreement on a quality nor a warranty for quality. The catalogue descriptions are drawn up by the Auktionshaus Kaupp GmbH to the best of their knowledge and belief and with great care. In case of interest, a condition report from the Auktionshaus Kaupp GmbH can be requested for each of the objects of art to be auctioned off. All objects to be auctioned off are used and are sold to the exclusion of warranty. The exception to this provision is damage arising from injuries to life, limb or health in cases where a negligent violation of duty by the user or a deliberate or negligent violation of duty committed by a legal representative or vicarious agent of the user. The catalogue text in the German language shall be binding. The auctioneer accepts no liability for faulty translations of the catalogue texts. 3. Damage claims against the Auktionshaus Kaupp GmbH (hereinafter referred to as «auctioneer») based on defects of title and material defects and other legal reasons (incl. reimbursement of wasted expenditure) shall be excluded. The exception to this provision is damage arising from injuries to life, limb or health in cases where a negligent violation of duty by the user or a deliberate or negligent violation of duty committed by a legal representative or vicarious agent of the user and other damage arising from grossly negligent violation of duty by the user or a deliberate or grossly negligent violation of duty committed by a legal representative or vicarious agent of the user or as determined by product liability law. 3 a. Books that get called up were not checked for completeness. 4. The auctioneer has the right to offer, combine, separate or withdraw numbers outside of the order of the catalogue. 5. The bid of the highest bidder shall be accepted if no higher bid is made after the bid was called out three times. The auctioneer may reserve or refuse acceptance on behalf of the client. If several persons make the same bid at the same time and if no higher bid is made after it was called out three times, the decision will be made by drawing lots. The auctioneer shall take back acceptance and offer the object once again if a bid that was visibly made in time was overlooked by mistake. Usually bids are increased in increments of 10 %. 6. Acceptance shall oblige the buyer to pay and accept. Property in the object auctioned off shall only pass to the buyer after complete payment of all claims of the auctioneer. Vis-à-vis the auctioneer, the buyer may only offset uncontested or legally established claims. The risk of incidental loss and incidental deterioration of the object shall be transferred to the buyer upon acceptance. 26 % shall be paid to the auctioneer, plus the statutory value added tax to be paid for the surcharge. The total amount shall become due and payable upon acceptance in cash or with EC card with presentation of a valid identity card, credit cards will not be accepted. Payments of non-resident buyers who submitted their bids in writing or by telephone shall become payable within eight days after the invoice date. Any bank charges shall be at the buyer’s expense. 9. Default of payment shall occur two weeks after the invoice date. From the occurrence of default onwards, interest to the amount of 1 % per month shall become payable for the purchase price without prejudice to further damage claims. If the buyer is in default of payment, the auctioneer may rescind the contract after having fixed a period of grace. In the event of rescission, all rights of the buyer regarding the purchased object shall be forfeited. In this case, the auctioneer shall have the right to claim damages to the amount of the lost charge for the object auctioned off (consignor commission and buyer’s premium) as well as costs incurred for catalogue pictures from the buyer. In addition, the buyer shall be liable for transport, storage and auctioneering expenses until return or repeated selling of the object by auction. If the object is auctioned off in the next auction or the one after that, the buyer shall be liable in addition for any shortfall in proceeds. He shall not be entitled to higher proceeds. If the auctioneer optionally requests performance, the buyer shall be obliged to make an advance payment in the case of default in payment as far as the purchase price due and the surcharge are concerned. The auctioneer shall have the right to exclude him/her from further bids in the auction and to pass his /her name and address on to other auction houses for the purpose of banning him / her. 10. The handing over of purchased objects and the issuing of invoices, in particular during or right after the auction, will be carried out under the reserve that no mistakes were made. 11. The purchased objects shall only be handed over to the buyer after complete settlement of all claims of the auction house. 12. The buyer shall pick up the purchased objects 14 days after the date of invoice at the latest. If the buyer is in default with pickup/acceptance, the auctioneer shall have the right to put the object in storage at his/her expense and risk on his or third-party premises, and the buyer shall also pay the costs for any necessary insurance. If the auctioneer puts the object in storage on his own premises, the buyer shall pay a fee of up to 8 € plus statutory vat after a period of 14 days for storage for each object per day. The buyer shall have the right to show proof of the fact that the costs were not incurred and/or not incurred in that amount. If the buyer requests that the purchased object be shipped to him, this shall be done at the buyer’s expense and risk. The costs for packaging, insurance and shipment shall be borne by the buyer. Shipment orders will only be carried out if the auctioneer was given a written shipment order. 13. Written bids will be executed on behalf of the bidder. The price written in the bid form shall be deemed the highest bid, bids may also be accepted for a lower price. Bidder’s orders can only be executed in a binding manner if they are submitted completed in block letters and one day before the auction starts. Only the specified catalogue number and not the title of the object shall be binding. 13 a. Written bids shall be binding and cannot be taken back. 14. Telephone bidders will be called at the auctioneer’s expenses before the respective item is called up if a written order for that was submitted in time. This kind of order can only be executed from a limit price of 250 € onwards, with the bidders undertaking to offer at least the limit price. No warranty can be assumed for the establishment of the telephone connection. 15. The terms and conditions of auction shall apply mutatis mutandis also to post-auction sales or to discretionary sales. 16. The place of performance shall be Sulzburg. If the buyer is a businessman or if he has no domestic place of general jurisdiction, the place of jurisdiction shall be Müllheim / Baden. German law shall be applicable. The UN Convention on Contracts for the International Sale of Goods shall not apply. Should one or several provisions of these terms and conditions of auction be or become invalid, the validity of the remaining provisions shall remain unaffected thereof. The English version of our terms and conditions of auction are for information only. In case of doubt, the German text is legally binding. 16 a. In the relationship with the owner, the buyer assumes payment of half the statutory resale rights fee (2 % of the hammer price). It shall be indicated separately in the invoice and becomes due pursuant to § 26, Section 1, UrhG [Copyright Act] for sales of originals of works of fine arts the copyrights for which have not lapsed yet.